There will be a new man in charge at Rugby Town next season, after boss Dave Stringer and the club parted company by mutual consent at the end of last week. The decision came after a season which saw Valley narrowly miss out on a third consecutive place in the Southern League Central Division play-offs, and marks the end of a five year spell at Butlin Road for Stringer – the last four as first-team manager. Interviewed after Town’s final game of the campaign last week, Stringer had expressed doubts regarding his future and following a meeting with club officials last Friday, the news of his departure was confirmed on the club’s website. 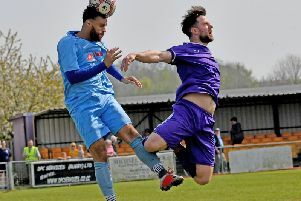 Despite the unsatisfactory conclusion to this season – which saw Town lose their last three matches and finish five points adrift of the play-off zone as a result, Valley Chairman Brian Melvin was keen to recognise the contribution of the one-time Rugby midfielder during his tenure. He said: “We had a long discussion with Dave, and it was agreed that it was time for a fresh approach and outlook from a managerial perspective, and hopefully the opportunity for a new challenge elsewhere for Dave too. “Dave has worked hard for the club in his time here, and there are a lot of positives to be thankful for – especially in the two seasons in which we just missed out on being the division’s champions. Stringer joined the management team at Town for the start of the 2010/11 season as assistant to Martin Sockett, before taking over the full reins a year later. In his first season as manager, Rugby ended up one place out of the play-off zone in sixth, and then went on to achieve consecutive runners-up spots in 2012/13 and 2013/14, before recording another sixth place finish this season. Stringer presided over the breaking of a number of records in those two near-miss seasons, including amassing their biggest ever Southern League points total of 96 in 2012/13 and twice seeing his side score over 100 league goals for the first time too – but ultimately both times their promotion bid ended with lacklustre displays in the play-off knock-out phase. His final season will be remembered for the late slump though, with Valley finally slipping out of the top five after a run of just two wins from their final eight outings. This poor run included a return of just a single point from games at three of the division’s bottom four, and the Town boss cut an increasingly frustrated figure on the touchline as the season drew to a close, with his side’s impotency and other off-the-field issues appearing to take their toll. However Stringer does leave with the best stats percentage of any manager during the club’s time in the Southern League, finishing just one short of 100 league victories with a win ratio of 58.9%, and in terms of duration, his time at the helm is only surpassed by the long-serving Jimmy Knox and Tony Dobson’s four year and three month first spell at Butlin Road. The search has already started for Stringer’s replacement, with the Valley Chairman confirming that a number of good quality applications had already been received. # The Central Division play-off final on Monday saw Town’s local rivals Bedworth secure promotion with a 2-0 home victory over Barton on the Greenbacks’ artificial pitch. Another Warwickshire club Stratford will also line-up in the Southern League Premier Division following their 3-2 play-off final success over Larkhill, and they should be both joined there by Leamington – after the Brakes’ relegation from the Conference North. Nuneaton will also start the 2015/16 season a division lower after they finished bottom of the Conference National.